What is “big data”? It seems like everyone is talking about it. From the White House to The New York Times to higher education, “big data” is a big buzzword, and it has been for several years. But what does it mean for you and for your business? Generally speaking, big data is a way of describing the explosive amounts of data being generated as a result of our lives becoming increasingly more digital and connected. It also has to do with increased availability of that data, and what we can now do with it to better understand the world around us. 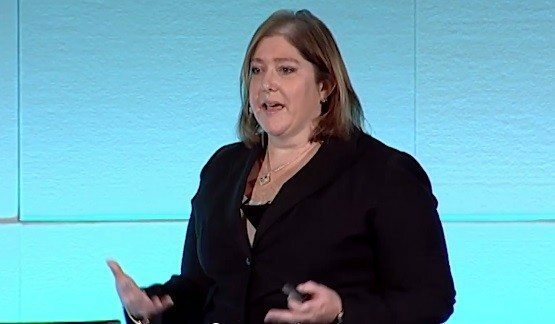 Cary Sylvester, vice president of technology innovation and communication for Keller Williams Realty International, explains “how the little guy can leverage big data,” at Real Estate Connect New York City (above). When it comes to real estate, we all have access to big data. What will set you apart from your competition is your ability to interpret that data and present it as expert knowledge to your clients. Thinking holistically about your bigger objectives, big data can help you understand how your customers are using your website and segment them accordingly to boost your bottom line, reveal meaningful patterns in sales history that can help you make better business decisions in the future, and add efficiency and insight into your transactions to reduce costs. Let’s break down big data and how you can use it to distinguish yourself from your competition by demonstrating your knowledge and creating a more tailored experience for your client. What do you do when you want to find the best Chinese takeout or a dry cleaner nearby? Google it! Well, the same holds true when you want to find out how many people are visiting your website every day — just Google it. Chances are you’ve heard of Google Analytics, and you may not realize that you have access to it, but you do. 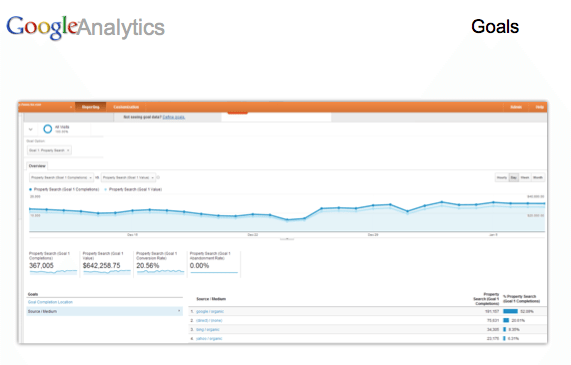 Google Analytics is Google for understanding your website. It automatically gathers data on your website, and lets you analyze that so you can reveal meaningful patterns — everything from how someone got to your site, what they’re doing and how long they’re staying, to whether they come back and how often. Let’s say you’re a small brokerage that’s just getting started and maybe you have limited resources. Chances are most people are finding you online, which means your website is crucial to growing your business. To evaluate your website’s effectiveness, you need to track your website’s click-through rates, keywords being searched and geographical summary, as that data offers invaluable insights into what potential clients are interested in and where they’re located. As a broker and business owner, you should be setting goals for your website and your business. You can do that right in Google Analytics and receive alerts when those goals are met. For example, you can see how many interactions you’re getting on your website and how many of those interactions turn into viewings. You can also set a target area for your region and see if some of your sales, marketing or public relations initiatives have made any measurable change in driving traffic and conversions. This Google Analytics graph demonstrates how you can monitor your goals. In this particular graph, we’re looking at the website traffic for a specific neighborhood. In other words, how many clicks I hope to get for homes in a particular neighborhood versus how many clicks I actually did get. Google Analytics can also help with intelligence alerts. If you track the traffic patterns on your brokerage website, or any website for that matter, you know that you can track what your customers are doing and target them more intelligently based on that activity. That’s big data in action. A good example of this is Twiddy, the vacation rental site. They have installed a widget for intelligence alerts. When someone is searching on their website, they’re using big data to find out how many people are doing that same search. That’s why you might suddenly receive an alert on your screen telling you to book right away before you can’t anymore. You’re reaching out to people who care, rather than to everyone. You’ve segmented your business and that makes business sense. The takeaway here is that you don’t have to hire a new IT person and you don’t have to spend a ton of money. You really don’t have to do anything other than take the information Google Analytics has gathered for you and use it to explore intelligence alerts that can help you understand where your business is at so you can meet, and hopefully exceed, your goals. Efficiency is important when you’re thinking about profitability. If you’re a broker who owns multiple offices and you’re already using dotloop, I like a tool called dotloop-DASHBOARD, which gives you one window into your entire business. For the first time, you can see where all deals stand at any time. DASHBOARD eliminates the friction of signing into several different online systems and gives you visible access to every deal being conducted by every agent across every office. Using DASHBOARD, you have insights that can help you run a better and more efficient business all around. For example, if you see that one agent is excelling while another isn’t signing as many deals, you can give the struggling agent the tools they need to be more successful — whether it’s mentoring from a more seasoned agent or continuing education classes. DASHBOARD also helps with efficiency related to compliance because you can store all of your paperwork in one place. You don’t have to hope all the legalese is there or go searching through files for various forms. With DASHBOARD you know it’s there — all in one place. Now that’s efficient. Once you have tapped into big data, how can you interpret it? One way is by leveraging historical performance to forecast the future. Tableau Software is a great way to create visual representations of your data that can help with forecasting. It’s an intuitive forecasting tool that allows you to upload data — such as sales or spending numbers — and create charts, graphs and other graphical representations to compare offices across your brokerage. You can explore profitability, income-to-expense ratio, or hot market areas by region, ownership or length of time in business. And what do you do with this information? One application would be to look at the sales history of a brokerage that’s been open for 10 years. Think of it like a health history for your business. You can use big data, just like a doctor can use your family history to predict your risk for certain diseases. Knowing what market areas have been hot or cold, or what times of the year yield more sales, can help you better train and guide your agents in a new brokerage. You can use big data to improve your business the same way you take referrals information and process it to understand where customers are coming from. If one office hasn’t met sales goals for the quarter, you’ll know they need to go after more listings. Or if another office is struggling to get business in a particular neighborhood, maybe you can ramp up your advertising efforts there. It takes a lot of the guesswork out of planning for your business. The No. 1 goal in using big data should be to make smart decisions. It seems basic, but people often forget that’s why they’re using it. Big technology changes in the real estate industry the last few years have produced a plethora of big data. Along with that comes tools that can help you process the data and make it useful for your business and your bottom line. Big data is more than just a buzzword. There’s a lot of useful information behind the hype. If you focus on understanding the data, and how you can use it to improve your business, your big data strategy is in the right direction. Cary Sylvester is vice president of technology innovation and communication for Keller Williams Realty International. Follow her on Twitter: @carysylvester.